This will guide you through upgrading your account. 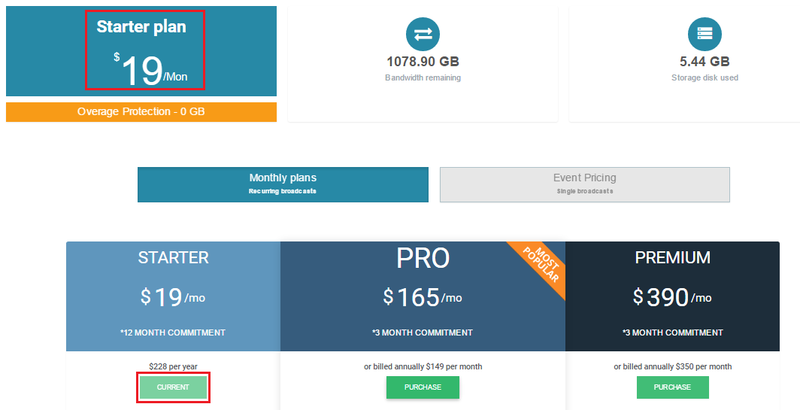 To remove the limitations of a trial account such as the channel restriction, the 15 viewers limit and the paying transcoding, you will need to purchase a plan. Monthly/Annual plan which is the best option if you are a recurring broadcaster. Discount is provided for an annual pro or annual premium plan because this is a prepaid plan. Event plan which is basically the purchase of additional bandwidth. This is adapted if you are planning to stream a single event. 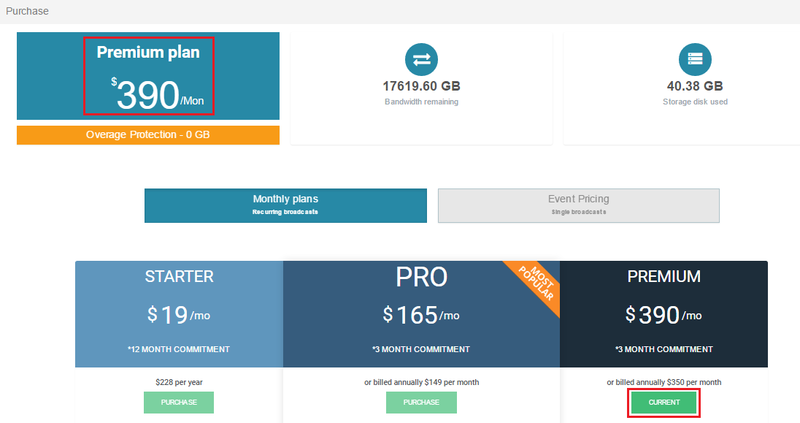 Please note that all event plan bandwidth expires 12 months (1 year) after being purchased. 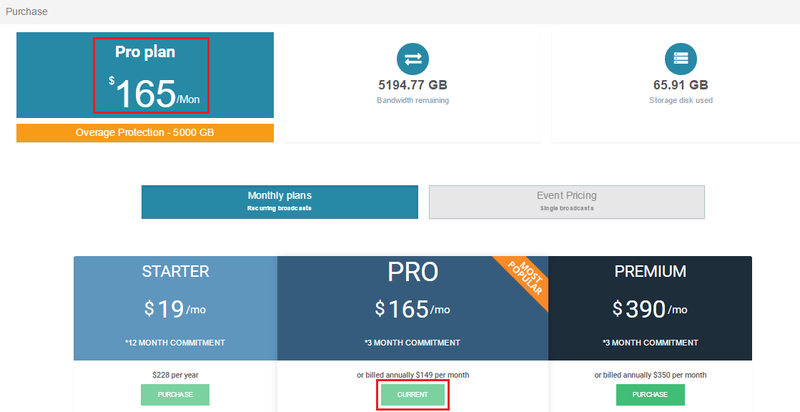 You can decide to upgrade your starter plan to a pro or a premium one anytime. Then please call us and we will grant you the prepaid data from your starter plan. 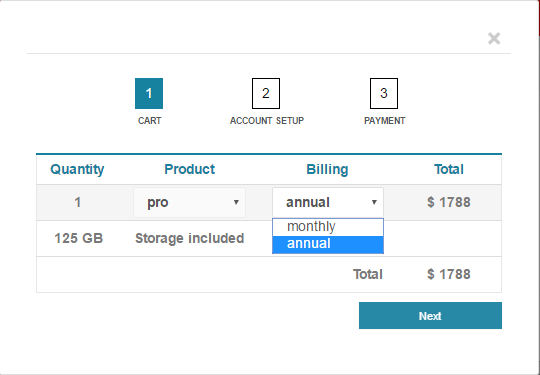 You can decide to upgrade your pro plan to a premium one anytime. To do so, you can just purchase an annual or monthly premium plan and then please call us so we grant you the prepaid data from your pro plan. You also have the possibility to downgrade your plan in case you realize that your needs will be covered by a starter plan. To do so please call us so they can find the best solution according to your bandwidth consumption. As for a Pro Plan, in case you change your mind before the end of your commitment, you can always call us to downgrade it. According to your needs and your bandwidth consumption we will offer you the best solution.